Wipe off the surface of your tiles clean and dry. 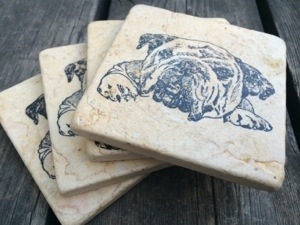 Stamp images onto the tile using any StazOn ink pad. After the image dries, spray a light coat of an acrylic sealer over the face of the tile. (Don’t saturate or spray too close to ensure that the ink does not bleed.) Wait at least 30 minutes and then spray the surface of the tile again. Let that second coat sit for at least an hour. Continue to repeat this step until you are satisfied with coverage. Let tiles sit overnight outside or in a garage to “dry” and lose their odor. After the tiles have dried, turn the tiles over and attach the coaster board to protect your table surface from the tile. This entry was posted in 3D, Uncategorized on April 9, 2014 by katzcreates.